There’s not a single doubt that ducted evaporative air conditioners are much more efficient in saving on energy bills than any other air conditioner systems. 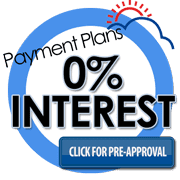 As a matter of fact ducted evaporative air conditioner is the best way to keep your family cool during those excessively hot summer days with little to pay for the comfort. At Rite Price Heating and Cooling, we are more than proud and excited to offer your family access to the full range of the best ducted evaporative brands in the industry. 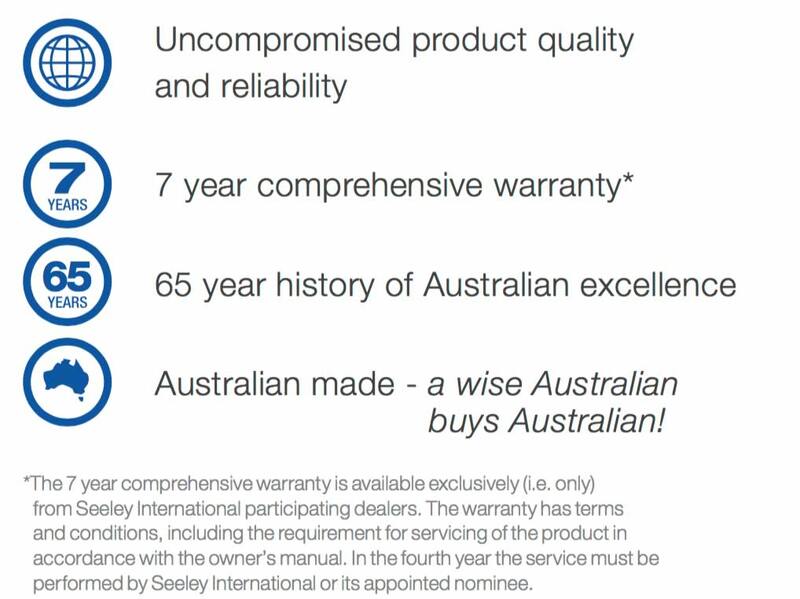 As an Australian owned family business, we carry and fly our country’s flag with pride and that’s why we carry brands such as Breezair, Braemar, and Coolair that are all locally made by the multi-award winning Seeley International at Lonsdale. If you are interested in these brands and you are wondering which one of the list to pick from, all you need to do is fill up our free no obligation quote form and one of our highly experience staff will give you a call right back to help you through the selection process. At Rite Price, we provide you with prompt inspections s well as giving your reliable installation and follow up support. Braemar evaporative air conditioner is locally made here in Australia and thus, it’s the idea evaporative air conditioner for our harsh weather conditions. Every part of the Braemar cooler is designed to deliver maximum cooling performance with minimum energy and water consumption. 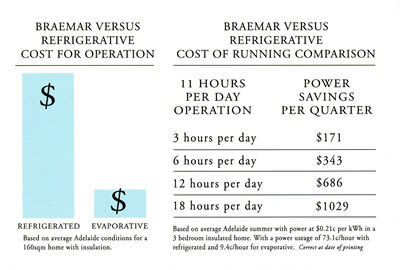 The reason for choosing Braemar evaporative air conditioners should not be solely based upon the fact that it’s an Australian made air conditioner, it should also be based on the fact that Braemar evaporative air conditioner has been in the air conditioning business for decades and with such experience, they are able to design and produce superior and advanced technology for all Australian family. The Braemar evaporative air conditioner is capable of delivering beautiful comfort to you and your family during the hottest heatwaves. One of the many superiority Braemar evaporative air conditioner bring to the table is it ability to operate at an ultra quiet state. 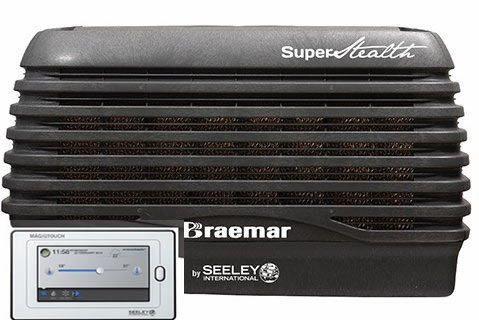 The Braemar evaporative air conditioner is built with the state of the art Stealth® fan that enables the air conditioner system to constantly produce an evenly distributed air through a brilliant channel call Chillcel pads. The combination of these two powerful components delivers a cool, quiet healthy and welcoming air into your home via a breeze.Braemar’s incredibly smart automatic drain valve. 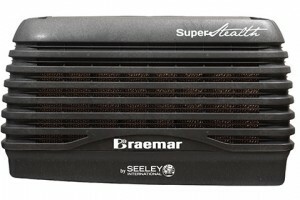 Another beauty of Braemar evaporative air conditioner system is the AUTOWinterseal features, which minimize the need for you having to go through seasonal maintenance as your system will automatically clean and empty its reservoir, leaving it clean and dry while closing off the air conditioner ducts to prevent cold draughts and heat loss during winter. Braemar evaporative air conditioners have always been the leader in innovative technology when it comes to improving and reimagining and rebuilding an efficient evaporative air conditioners. One of the many techniques that was pioneered by Braemar evaporative air conditioner was the integration of water distribution system into the design of cabinet. The result is a robust free flow distributor that not only reduces the number of moving parts in the cooler, but also ensures an even and reliable water coverage of the Chillcel pads. The Braemar evaporative air conditioner integrated water distribution system will not block the water flow to the pads and will not move out of place over time. Health is wealth they say. With Braemar evaporative air conditioners, you can be 100 percent sure that you and your family are getting pure and healthy fresh air whenever you turn on your evaporative air conditioner. And knowing that you are breathing in safe and healthy air and the knowledge you have that you live in a safe and healthy environment keeps you happy. With Braemar evaporative cooling, there are no stale, odorous, unhygienic air flow in your home. As if that was not enough, Braemar evaporative air conditioner uses up to 80% less electricity than any comparable refrigerated systems and that means you are saving big o your energy bills. Another great benefit of choosing a Braemar evaporative air conditioner is that you can keep the air fresh and circulating by leaving the doors and windows open which in turn, guarantees a natural, fresh and healthy form of “lifestyle” cooling. Running an evaporative air conditioner system from Braemar, you know you and your family lives in an allergy free asthma-safe environment and for many families here in Australia, knowing that they live in such a safe environment mean a great deal to them. The fact that it’s perfectly fine to run your air conditioner with your doors and windows open for fresh air makes it conducive to have a great outdoor lifestyle with kids running in and out without the heartache of shutting the door and reopening it over and over again. Also, for those families who love to have their pets running freely around, Braemar evaporative air conditioner is your number one choice. 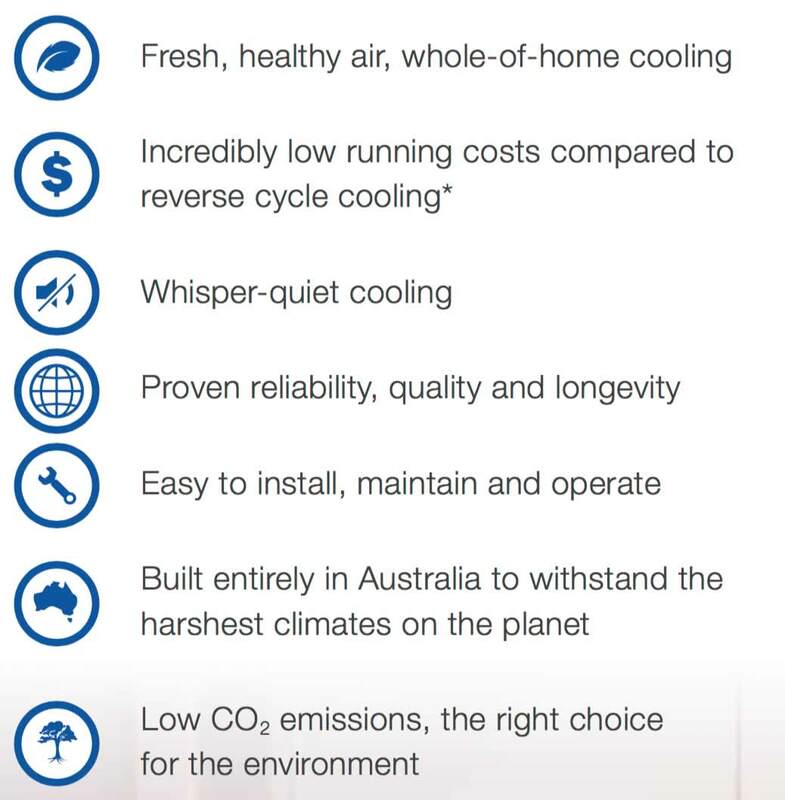 For more than 65 years Braemar has been providing Australian families with the world’s best, most energy-efficient cooling and heating products and has cemented its reputation as a highly trusted and innovative Australian brand. 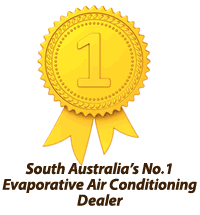 Braemar evaporative cooling is a proven high performer and a household name for evaporative cooling in Australia. Operating your Braemar air conditioner is easy with the MagIQtouch Controller. Smart, sophisticated and intuitive, its discreet, modern design will blend seamlessly into the decor of your home. as easy to use as your familiar touch screens, this controller’s intuitive user navigation system makes operating simple. Keeping your home and your family cool in summer is easy and economical with the MagIQtouch Controller and your Braemar evaporative air conditioner. REASONS BRAEMAR EVAPORATIVE AIR CONDITIONER IS YOUR IDEAL CHOICE? The traditional air conditioner systems are built to use refrigerants or heat pumps, evaporative cooling air conditioners however, and designed to use water cycle which was built to mimic the science of evaporation. This evaporative cooling air conditioner technology works by passing hot air over wet pads, the air then absorbs the water from the pads and turns it into water vapor through the process of evaporation. Evaporating the water is a process that requires molecular energy (heat), which means the air gets cooler after evaporating the water.This is the natural process that Braemar evaporative cooling air conditioner uses to keep your family cool during the blazing summer season. Rite Price Heating and Cooling is a South Australian family owned business that have been looking after all South Australians for decades. As a family business, we know first hand what your family need to keep them cooling during the intensely hot summer we experience here in South Australia. Also, with our decades of experience in the air conditioning industry here in Adelaide South Australia, we know what suit the South Australian home owners and what’s best for what season. 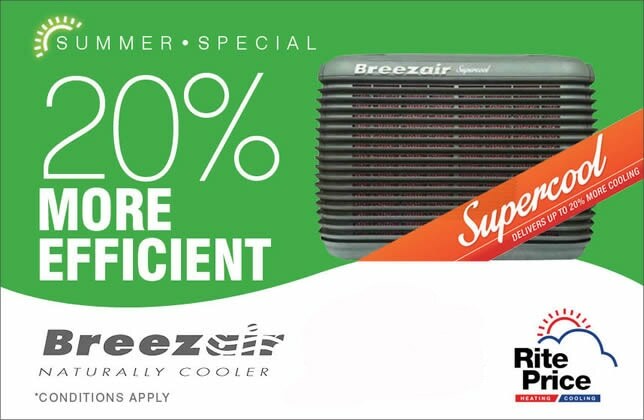 We’re proud to be South Australia’s top evaporative cooling dealer, and we offer a host of evaporative coolers from well-known companies like Breezair, Cooler, and Braemar – all manufactured by the award-winning Seeley International in Lonsdale. At Rite Price Heating and Cooling, we are very confident about our services, so confident that we will give you a free no obligation quote and inspection and most importantly, we back our evaporative air conditioners with a 10-year structural warranty and a 25-year warranty on the injection moulded cabinet. Living healthy in your own home comes natural when you install Braemar evaporative cooling air conditioner. For more information or to join the evaporative cooling revolution today. Ask about our fantastic offers on Braemar Evaporative systems. Call now or visit one of our stores.